What is a Trash Flip Gate? Litter often finds its way to large rivers and oceans by means of smaller streams and tributaries. Trash easily floats along the surface until it reaches large bodies of water and can result in environmental damage. 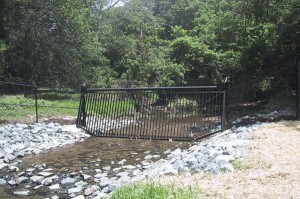 Trash flip gates are one method used to combat this problem. 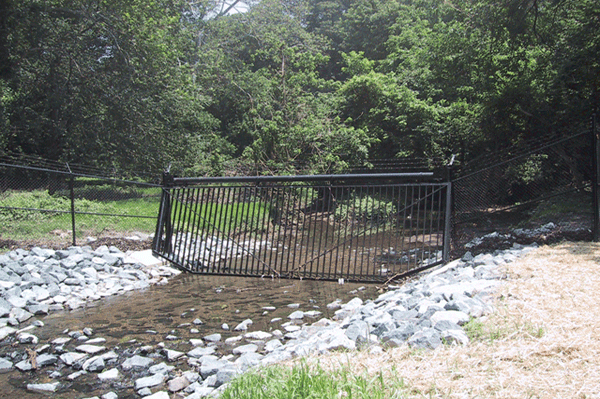 Essentially, a trash flip gate is a gate that crosses a small, moving body of water such as a stream, and skims trash off the surface. The trash gets stuck at the gate, where it can be collected and disposed of in a more environmentally friendly manner. Trash gates can be used in conjunction with other fencing in order to prevent access to a secured area as well, as seen in the photo below. This entry was posted on Friday, February 28th, 2014 at 4:25 pm. Both comments and pings are currently closed.